A friend once commented that the only thing we can really give our children is memories. That’s a pretty important statement because it covers a lot of ground. Memories can be of lessons learned, like my mother teaching me manners or how to make a bed, or they can be painful, like hurt feelings or physical injuries or loss of loved ones. He was referring to the good ones, the fun ones, the special ones. Watching my four year old granddaughter, who has already lost her Daddy and her other grandmother in her short life, I am amazed once again at how much little ones observe and remember. She’s at the age where she says “remember when…” a lot, already placing her memories in her ever so short past. But they are definitely stored there and who knows when she will bring them back into a conversation or how they will ultimately affect her life. 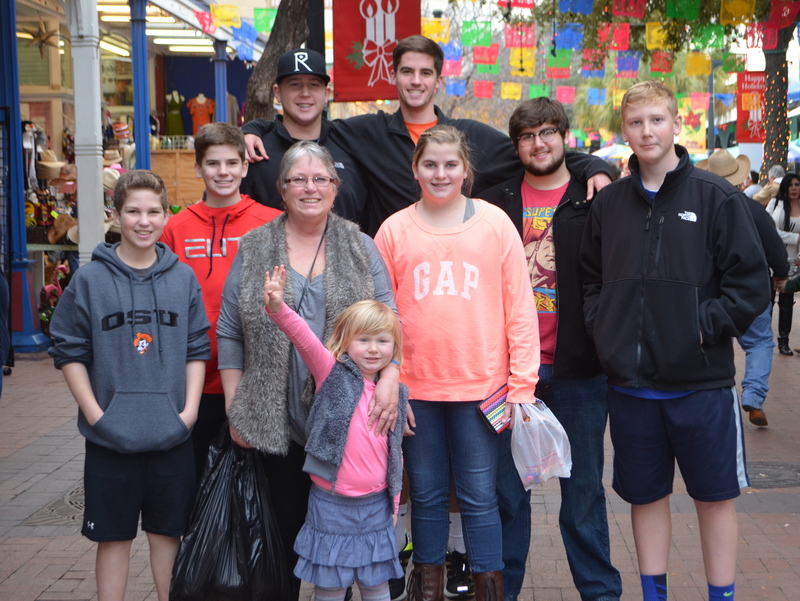 For Christmas, I gave my family a trip, a long weekend together, to Austin and San Antonio. The weekend after Christmas was the first time we could find that their schedules weren’t bogged down with sports or school or work, almost an impossibility to bring four families, 16 people together. But we did it. We spent four days traveling in four cars to two cities with eight adults and eight kids ranging from 12-16 with one four year old. The gift for me was watching them all together, enjoying each other. We all live in the same city but it’s hard to find time to just relax and enjoy each other. The bigger kids go to school together and are close friends, so there was no teenage drama, no teen rolling his or her eyes at the parents. The little one was silly and the older ones were amused and helped with her antics. The parents all parented all the kids. I just got to sit and watch. And love them all. Looking back at my own life, I have every kind of memory, good, bad, sad, funny. In all our lives, there are things that can’t be avoided, things that hurt, events and people we would like to forget. At best, we can learn and grow from them and put them in perspective. But, it’s important to have good memories, sweet memories, funny memories, to help balance it all out. My obsession with photos helps me with that. Not every memory has to be as elaborate as the trip we took, but it was great. We have many memories that cost us nothing and happened right at home. And, when we gather, whether it’s all of us or with some absent, all those memories are part of the conversation. The gift for me is that my family has grown into a loud, laughing, loving bunch where there are no awkward silences, no sulking members, no hateful scenes and lots of the very best kind of memories. My resolution for 2014 is to make more of the good kind for everyone I know, family or friend. Happy New Year!